Activities – strictly speaking, the Xsight is not an activity-based remote control. Activities as used here are erroneously named macros. When you use the “activity” term, it is understood that certain features employed by all other activity-based remote controls will be available, and they aren’t. At minimum I would expect separation between device and activity command lists, and better device power handling. Thus, these are simply macro and punchthrough wrappers for a device. User profiles – there are none. A promotional video advertises “create unique profiles online for each family member… program personalized activities for adults, kids or frequent guests… now your remote can change personalities with the touch of a button”. Instead, what we have are favorite channels that can be broken into several smaller groups – whether that be for “Mom” and “The Kids” or “Sports” and “HDTV” is entirely up to how you name them. Computer programmable – partially, but required. It’s almost as if the designers were uncertain whether they should make the Xsight programmable entirely onboard, or via computer… and in the end decided to split the difference without duplication between the two. If you’re the sort who demands a more advanced level of customization from your remote the Xsight is technically capable of delivering, but only after much planning and perseverance. Easiest and most intuitive remote ever – probably not. The reality is it’s extremely difficult to make a complex item like an advanced remote control easy for both programming and operation, but the Xsight isn’t the best implementation yet seen. Those nagging software issues certainly don’t help the cause (and it’s not like there weren’t existing activity-based remotes to study and improve upon), but the benefit of having a robust hardware platform like the Xsight is that simple software can always be changed. I’d like to say that there was a hope of future improvements, but at the time of this review the Xsight has been available in Europe for over a year, and so if it hasn’t happened by now it’s not likely to. And yet, even with all of that, there’s good news to talk about: everything that the Xsight Touch does right. Namely, behave like a normal universal remote control! Had it been marketed as a standard device-based remote with macros and learning and a color touchscreen, and had it not been priced at $249.99 MSRP, this might well have been a very different review. 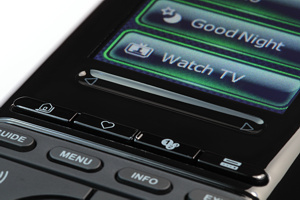 The Xsight Touch can control an impressive 18 devices. It includes UEI’s wonderful preprogrammed code database and all of the extended functions that entails. It supports nearly unlimited macros and learned codes. It has an advanced punchthrough system with in-device key aliasing, a feature normally available only on high-end remotes. It has favorite channel groups with user-customizable station icons. It has an above-average hardware design with an excellent selection of hard buttons and nifty backlighting. It also has a rechargeable battery and docking station, pickup sensor, optional RF extender – there really is a lot of good stuff to go around here. And you want some really good news? The Xsight series is often available on Amazon.com at close to half of list price. 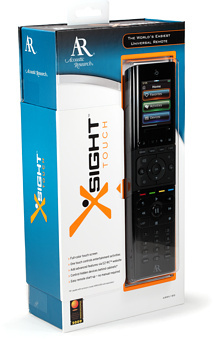 Priced like that, and with a clear understanding of what it can and can’t do, the Xsight is really not a bad deal.